If you've watched my Instagram Stories anytime in the last few months, or are my friend on my personal Facebook, you have probably been cordially introduced to the family that I lovingly refer to as my apartment balcony subletters... aka the world's cutest and most entertaining pigeon family! I honestly never thought much at all about pigeons in my first 23 and a half years of life, but since April 2018 I have been readily invested in anything to do with this family of birds that has made my balcony their home. 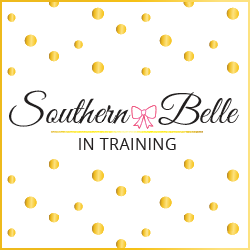 So without further ado, the Southern Belle in Training blog post introduction to my new friends! Sometime between the night of April 12th and the morning of April 14th, 2018, a mom and dad pigeon arrived on the balcony of my Charlottesville apartment and made a nest. I remember reading on the balcony after work on the evening of Thursday, April 12th. On April 13th- I had a really long day at work followed by an event after work, so I was gone all day and didn't even have a chance to glance at my balcony. On Saturday April 14th, I suddenly noticed that a bird's nest with an egg in it had arrived in the corner of the balcony! Fortunately, they made their nest in the corner that's easiest for me to view from inside my living room. Within a couple days in April, a second egg arrived in the nest!! (Sadly, the second egg never hatched. 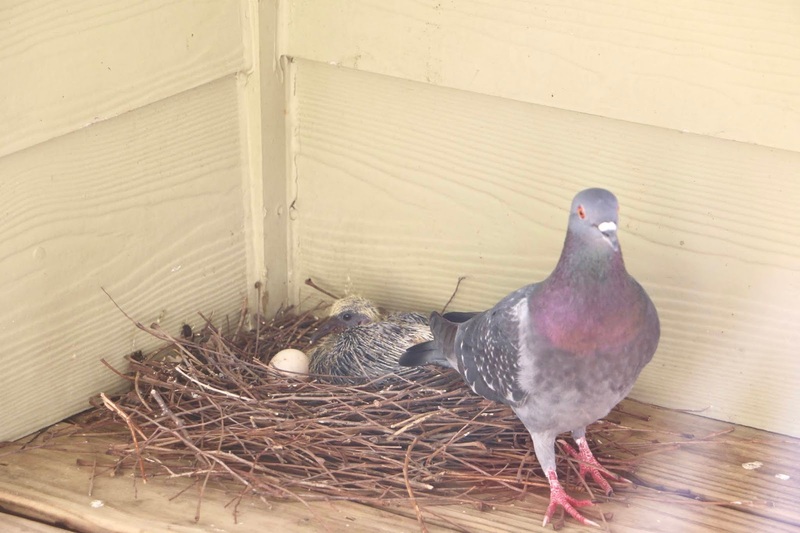 😓) Mom and Dad pigeon took turns sitting on the eggs each day, rarely leaving the nest unattended. Back in April I was too scared to go out on the balcony at all, so I would watch them and photograph them from inside my living room. When the pigeons first arrived, I didn't know how long it took for the eggs to hatch! I just assumed it would be only a few days. It seemed like such a long wait for the first round of babies to be born! I jokingly named the mom bird "April the Pigeon" after April the Giraffe (the pregnant giraffe that went viral last year). I got so excited for the arrival of the two eggs! I learned through some google research about pigeons that eggs take between 17-19 days to hatch, and I think the first baby was hatched on the 18th day. Sadly, its sibling didn't make it. But Baby Bird #1 was oh so cute!! I had never seen a baby pigeon before so watching the little family love on their first baby was the cutest thing I'd ever seen. Mom and Dad were the most protective by far with the first baby. They almost NEVER left it during its first two weeks of life. It grew into what I call an "awkward teenage bird" by the end of May (much bigger, but still not flying). I went away for Memorial Day Weekend and I was so worried that Baby Bird #1 would have flown away and left the nest when I returned home. Amazingly, it was still there when I got back- just learning how to fly! Baby Bird #1 finally started flying and one day in early June, he/she didn't come back to the nest that night. 🙁 I was a little bit heartbroken! I had really grown to love the little pigeon family on the balcony- despite the fact that they made a huge mess with their droppings- ha! It had been a few days since any pigeons were on my balcony, and I was just starting to think that maybe I should clean the nest. Then one day I happened to glance at the balcony as I walked across my apartment- and I could have sworn that I say the Mom and Dad pigeons.... er... having an "intimate moment" in the nest. It was the type of thing where I ran back to the window and did a double take. They had already flown away after seeing me, but a couple days later... MOM PIGEON WAS BACK AND LAYING ON AN EGG!!!! I am not even kidding- I ran to grab my phone and texted at least 20 people in my contacts that "ANOTHER ONE IS COMING" (cue DJ Khaled "anotha one!"). I was overjoyed. I came into work that day showing everyone pictures of the new egg. I debated adding the title of "Pigeon Landlord" to my Linkedin. A few days after the first egg, a second one arrived! Sadly that one did hatch but didn't end up surviving. 😢But one of them did- and Baby #2 was born at the end of June! Mom and Dad would leave Baby #2 unattended more often, and I finally started going out onto the balcony in June so that I could take some higher quality pictures! I love the last picture from this month- you can see how fuzzy the babies are. Baby Bird #2 was in that cute stage of being not a baby but not full grown- the teenage bird stage, when a surprise arrived on the balcony! Mom laid her THIRD egg- and yes, this one was laid before Baby Bird #2 was flying or had left the nest! There were some tight quarters in there for awhile, as Mom pigeon would try and lay on the egg, and the second baby was still trying to stay in the nest too. Sometimes when Mom or Dad would leave the nest, Baby Bird #2 would cuddle and lie on the egg- which was SO CUTE! Already looking after its little sibling (this is what the second picture below is of!). Baby Bird #3 arrived at the end of July, and this one is my favorite baby! It had SO MUCH fuzzy yellow fur when it arrived- it seriously looked like a teeny tiny baby duck and absolutely melted my heart. My little family is still growing strong! Baby Bird #2 started flying last month, but it still comes back and hangs out by the nest when the parents are there. I'm not sure what happened to Baby Bird #1, but maybe he/she visits too! Baby Bird #3 is still in the cute and cuddly stage. No signs yet of a 4th egg.... but I'm hoping there will be one! The picture below if of Mom, Baby 3, and Baby 2 is lying in front of them! So cute!! Something that I learned while researching about pigeons this summer is that the male and females mate for life!! So it is the same family that keeps returning to my balcony. How sweet is that? Pigeons are wonderful parents and I love watching them feeds the babies. Unfortunately feeding is a quick process and they get very self conscious if they see me pull out a camera during it, so I don't have many photos of it. But it is cute! It looks like they're making out when they're feeding. A few questions I've gotten about them: have I fed them at all? Just once! I had some old pizza crust in my apartment and I tore it up and put it on the balcony. It took them a few days to eat it but they finally did. And the other popular question is if I've petted any of them. The answer to that is no! The parents flee and fly to the roof anytime I make a lot of noise in my living room, or come onto the balcony with my camera. I've read online that the babies are the easiest to pet and pick up- but I'm worried if I did that the parents would smell "human" in the nest and they would abandon it. So for now- no pigeons cuddles! I realize this post is WAY different than my normal blog content- but I hope that y'all enjoyed! Should the pigeons leave for good anytime soon or if I don't renew my apartment lease... I am glad I have all of these fun photos to remember the summer that I became an honorary pigeon landlord! Aww, they're so cute! Who would've thought you would've had pigeons at your new place?! haha. Wow! Crazy to watch the whole process. Amazing! Ahh I love seeing your pigeon updates on IG Stories! This was so fun to read a whole in-depth post on them! I LOVE THIS! Do you think pigeons mate for life? Seems like they're a forever couple! WOW! Annaliese - this is so cool! I'd never seen a baby pigeon before - they are so cute :) You're a great Pigeon Landlord LOL!!! I just love how pigeons are monogamous...I didn't know that! Thanks for sharing :) ! I have to be honest, pigeons are my biggest fear. I don't know what it is about them but I think they're so gross and I keep far far away from them! Lol. Oh my gosh what a story! they are so cute, gad your little family is well! I really thought this was a joke at first but oh my goodness how hilarious. I grew up near a lot of deer and when I'd wait for the bus in the morning, they'd just hang out next to me and eat some grass. This is so freaking cute! I love that you've been keeping up with their little family life for so long! I love how you've been documenting this and taking photos! I'm not a big bird person, but it was fun to read your blog post and hear the saga of these pigeons! Wait this is too ADORABLE! I didn't know about the pigeons before but now I want updates! I love how you documented everything with photos too, this is just so sweet.